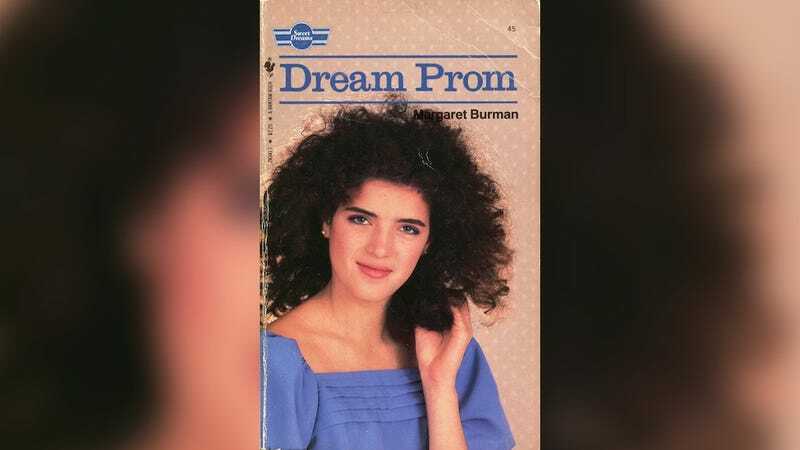 What One 1983 Teen Romance Had to Say About the Prom: It's Literally a Dream Come True! Dig out your blue eyeshadow, your body glitter and your Aqua Net, because it’s time for PROM WEEK on Pictorial. It’s 1983, and high school sophomore Molly Knight wants three things: to pursue a career in broadcast journalism like her local TV idol, the glamorous Faith Campbell; to date the most popular boy in school, sad-eyed Duncan Grover; and to attend a formal prom. That is the premise of Dream Prom, a teen romance from the imprint “Sweet Dreams,” labeled as appropriate for readers 11 and older. The book shared a publisher with and there are in fact ads in the back for the Sweet Valley High series. We meet Molly the morning after her Sweet Sixteen party, which was a huge success because her crush, Duncan (!!!) attended, slow danced with her, and left her a note afterward saying he wants to get to know her better. VERY MAJOR. Unfortunately, Duncan takes too long to call and instead she hears from his best friend, Matt, who wants to take her out. She says sure—but only as friends! But not this year, though. Matt offers to make her dream come true: This year, it’ll be a proper affair, and he would be happy to take her. She demurs—she doesn’t want to date Matt, she wants to date Duncan. Nevertheless, he gallantly insists the invitation will stand. And what about me? What about my dream? It was such a perfect, complete dream—the prom, Granny’s white gown, and Duncan. It was going to be the night of my life, the kind of experience you remember until you are old and gray, just like Granny. And I’d always know that it had to happen with someone I cared for a lot. That was part of the dream, part of what made it so magical. Oh, why had Duncan asked me to the prom? Now I wished he’d never invited me. First he’d taken my dream and made it real, not just fantasy. And now he’d destroyed even the fantasy. I almost hated him. They fight over this several times. One tiff is resolved after she’s interviewed about a paper she’s written by—you guessed it!—her local TV idol Faith Campbell. Oh, meanwhile, she tells Matt thanks but no thanks and he should take her friend Maria instead, who totally adores him, but he insists on keeping the offer open because—hand to God—his older brother got a dishonorable discharge from the Army and he refuses to go back on his word, ever. That is, until Molly gets a job working at the local radio station and her boss decides to give her a segment launching their new feature, “From the Teen Point of View,” and she talks about when a promise isn’t really a promise and Matt sees the light. Hallelujah! Finally, Duncan accepts her tutoring, they study like hell, and he passes English. Only now they’ve got tension over whether Molly is happy for the right reasons. All she cares about is prom—doesn’t she care that he can graduate and go to college now? Then I went downstairs to wait for Duncan to pick me up. I didn’t even look in the mirror again. Strangely, I lost interest in my white ball gown, my white gloves, and white high-heeled sandals. My trembling stopped, and my doubts vanished. I wasn’t worried about how I looked. I’d pulled my hair into a pile of curls on the top of my head and held it in place with two rhinestone hair combs. Little wisps of hair fell over my forehead and curled daintily around my neck. And I wasn’t thinking about the pearl earrings Mom had held out for me just an hour before.